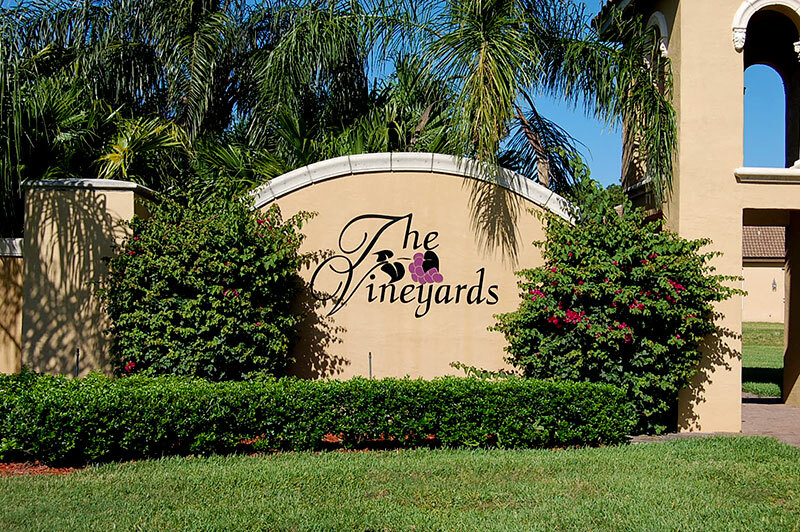 Discover The Vineyards at St. Lucie West! The Vineyards, a Hanover Homes premium lifestyle community, was influenced by the works of Addison Mizner. The Vineyards sub-division is located just north of Crosstown Parkway and West of I-95 in St. Lucie West. The Vineyards has single family homes with a Mediterranean flavor, ranging from $270,00 to $380,000. The gated community features professionally designed landscaping with a clubhouse and community pool. All homes have city sewer and water. With their old world charm of Tuscany vineyards, magnificent landscaping and beautiful views, homes for sale in The Vineyards represent excellent real estate values. The homes were built in the 2000′s by Hanover Homes who gave the community an old world Tuscan design with Mediterranean features like barrel tile roofs, columns and brick paver driveways. Some of the homes have lake views and feature 2 and 3 car garages. Hanover Homesand combines Addison Mizner influenced Mediterranean features with cutting edge modern conveniences. The 127 acre community has 37 acres of sparkling lakes and nature preserves to ensure a sense of privacy and natural beauty. If you drive a few minutes north on California Blvd, you will find retail establishments, restaurants, and entertainment facilities including the Rave movie theaters, Superplay USA, and Digital Domain, the Mets Stadium where the New York Mets conduct their spring training. If golfing is your thing, PGA Village Learning Center and Public Golf Complex is located just minutes away as well. The Vineyards Electrician – Goodiel Electric. Looking for a The Vineyards electrician?